March 10, 2016What’s Eating at Pluto? Far out in the western hemisphere of Pluto, scientists on NASA’s New Horizons mission have discovered what looks like a giant bite-mark on the planet’s surface. In this image, north is up. The southern portion of the left inset above shows the cratered plateau uplands informally named Vega Terra (note that all feature names are informal). This terrain is separated from the young, nearly uncratered, mottled plains of Piri Planitia in the center of the image by a generally north-facing jagged scarp called Piri Rupes. The scarp breaks up into isolated mesas in several places. Cutting diagonally across Piri Planitia is the long extensional fault of Inanna Fossa, which stretches eastward 370 miles (600 kilometers) from here to the western edge of the great nitrogen ice plains of Sputnik Planum. 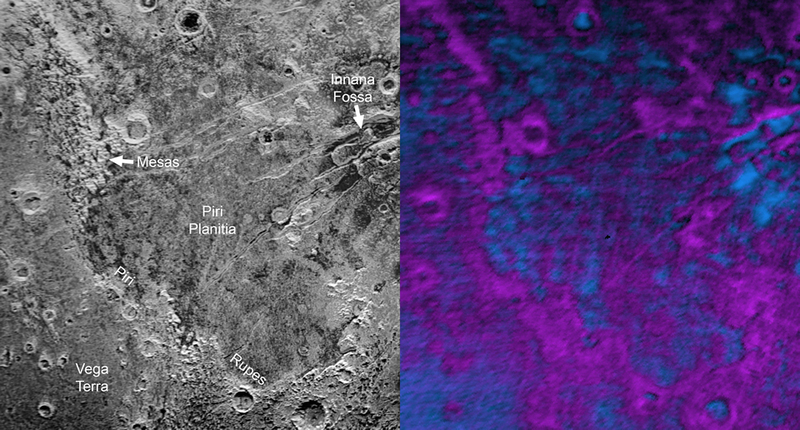 Compositional data from the New Horizons spacecraft’s Ralph/Linear Etalon Imaging Spectral Array (LEISA) instrument, shown in the right inset, indicate that the plateau uplands south of Piri Rupes are rich in methane ice (shown in false color as purple). Scientists speculate that sublimation of methane may be causing the plateau material to erode along the face of the scarp cliffs, causing them to retreat south and leave the plains of Piri Planitia in their wake. Compositional data also show that the surface of Piri Planitia is more enriched in water ice (shown in false color as blue) than the plateau uplands, which may indicate that Piri Planitia’s surface is made of water ice bedrock, on top of which the layer of retreating methane ice had been sitting. Because the surface of Pluto is so cold, the water ice behaves like rock and is immobile. The light/dark mottled pattern of Piri Planitia in the left inset is reflected in the composition map, with the lighter areas corresponding to areas richer in methane – these may be remnants of methane that have not yet sublimated away entirely.